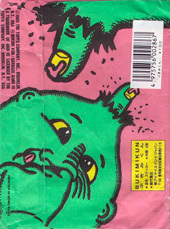 A set of 168 Garbage Pail Kids stickers were released in Japan in 1989. 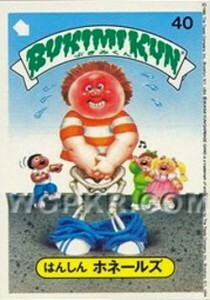 The Japanese version of Garbage Pail Kids were called ‘Bukimi Kun’. The Bukumi Kun release used the same characters and numbering as the Israeli ‘Havurat Ha’Zevel’ 1st series release. 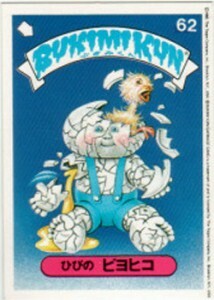 The Bukimi Kun release uses GPK characters from the U.S. Original Series 1, 2, 3, and 6. 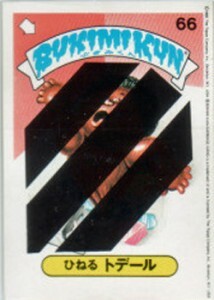 For some reason or another several of the Bukimi Kun stickers were censored. 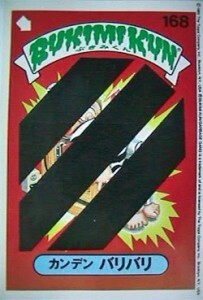 The cards were censored with three large black bars. Until September 2010 all that was seen of the release were single cards and an open wrapper. 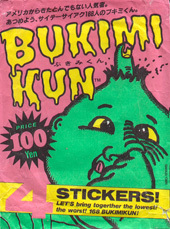 It was not uncommon for single Bukumi Kun stickers to fetch upwards of $500.00 in auction or private party sales. An album was rumored to exist but no pictures ever surfaced. On 22 September 2010 a new member of GPKUG claimed to have three Bukimi Kun albums. The poster claimed to have one album that was complete with all 168 stickers, one album that was empty and another partial album. The new forum member claimed to have purchased the Bukimi Kun items at the Chicago Comic Convention in approximately 2000 for $40.00 or $50.00. He posted pictures and videos of the albums. Some members of GPKUG even met with the forum member in person to examine the cards. There were some differences between the stickers in his album and the stickers that had been previously seen. None of the stickers in the full album were censored. This leads some collectors to believe that there were multiple print runs of the Bukimi Kun cards. On 4 October 2010 the full album and empty album went up for auction on eBay. The full album sold for a little over $2700.00. The empty album was bid up to $455.00 but the reserve was not met. The empty album later sold privately for an undisclosed amount. The partial album was also never auctioned and was sold privately. After the Bukimi Kun album auctions ended the forum member also came out with 110 more Bukimi Kun stickers. These stickers had been previously stuck onto paper (not in an album). The forum member cut the stickers out and sold them for approximately $20.00/each. Shortly after the Bukimi Kun album fiasco some pictures of a Bukimi Kun box surfaced. The picture was found on a Japanese website. 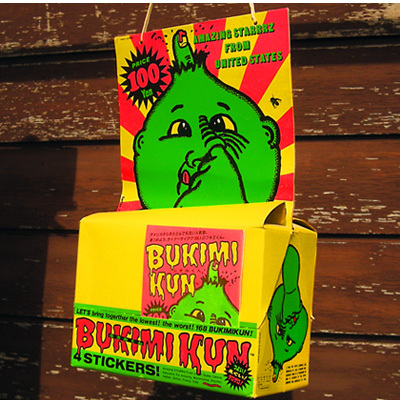 Bukimi Kun are still considered by many collectors to be some of the rarest and coolest foreign sets of Garbage Pail to ever be made. Below are full scans of every page of the full Bukimi Kun Album that was sold on eBay. Please click the images below for the full size scan. Fantastic article. The links to the scans of the album pages no longer work. Could you please send me the scan of page 24? I would like to see those cards up close.